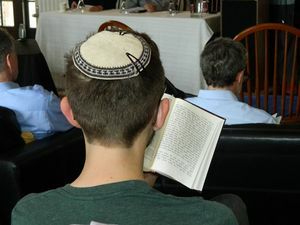 Among the Center’s areas of academic focus are modern Jewish literature and culture, Jewish-Christian and Jewish-Islamic relations from late antiquity to modernity, rabbinic Judaism, Jewish mysticism, and Jewish literary studies. With the support of the Center for Jewish Studies, the GTU offers a Master of Arts degree in Jewish studies as well as a Doctor of Philosophy that allows students to choose from a number of concentrations within the broad field of Jewish studies. The CJS also offers a certificate in Jewish studies for professional advancement in the field of Jewish education and Jewish communal life. Throughout the academic year, the Center for Jewish Studies offers colloquia, book talks, and lectures by eminent Jewish and non-Jewish scholars of Judaism, contributing to the richness of Jewish life in the San Francisco Bay Area. These events, including Jewish religious observances such as Shabbat services and holiday celebrations, draw a wide public audience. The Center for Jewish Studies was founded in 1968 with the appointment of David Winston as professor and director. At first, CJS served the seminary community, but it soon acquired students of its own and began offering degree programs. In the next few decades the faculty included Daniel Matt, David Biale, Joshua Holo, and Dina Stein. Among the visiting faculty have been: Jo Milgrom, Joshua Levinson, Yair Zackovitch, Marcia Falk, Rachel Biale, the late Rabbi Alan Lew, Rabbi Lawrence Kushner, and Peter Stein. The Richard S. Dinner Center for Jewish Studies is profoundly grateful for the generous support throughout the years of the Koret Foundation, the Taube Foundation for Jewish Life and Culture, Bernard Osher Jewish Philanthropies, Bernard Osher Jewish Philanthropies, Tauber Foundation, the Hellman Foundation, the Walter and Elise Haas Foundation, and all of our many friends in the community.